Last month I was invited to contribute to a series of articles, titled "Living With Water". This series is an initiative of Foreground, an online partnership between the Australian Institute of Landscape Architects, Uro Publishing and industry. Foreground's aim is to provide news and analysis on cities, places and the people who create them. Writing for this series was an opportunity to revisit some of my earlier research on Perth's water history in the context of the current water crisis in Cape Town and to highlight the role of history in contributing to water resource management and policy. With Perth's drying climate, successive governments in Western Australia have scrambled to find new water sources. Meanwhile water demand remains stubbornly high – a legacy of the city’s colonial past. In the early 1920s, irate voters finally convinced the state government to invest in a more reliable water supply system, including the Hills Water Supply Scheme, which took nearly twenty years to complete. Early measures to increase water supplies soon proved inadequate, as Perth’s citizens simply pursued a more profligate pattern of water use. These high levels of water consumption point to piped water being more than a conduit for basic sanitation, with personal and household cleanliness associated with white civilisation, morality, and feminine domesticity. Green lawns and English-style gardens upheld the perceived values of a cultivated and ordered streetscape, while also cooling the home and keeping dust at bay. The increasing accessibility to water supplies helped householders, usually wives and mothers, to overcome the difficulties that Perth’s sandy soils and long dry summers posed to meeting these standards. Early measures to increase water supplies soon proved inadequate, as Perth's citizens simply pursued a more profligate pattern of water use. By the late 1960s, hydrogeologists had begun to appreciate the extent of the groundwater reserves beneath the suburbs. And not a moment too soon: thanks to the end of the embargo on iron ore, Perth’s economy was booming, attracting a wave of newcomers to the city. The rapidly growing city, however, was entering an especially dry decade. The state’s water utility began to add groundwater to the city’s supplies, sourced from the Gnangara Mound in Perth’s north. Compared to other potential sources, such as piping water from the state’s northwest, groundwater was easily accessible, and therefore, affordable. By the end of the 1970s, nearly half of the city’s water supplies were drawn from groundwater reserves. Today, the Australian Bureau of Statistics estimates that about a quarter of Perth households have their own bore. 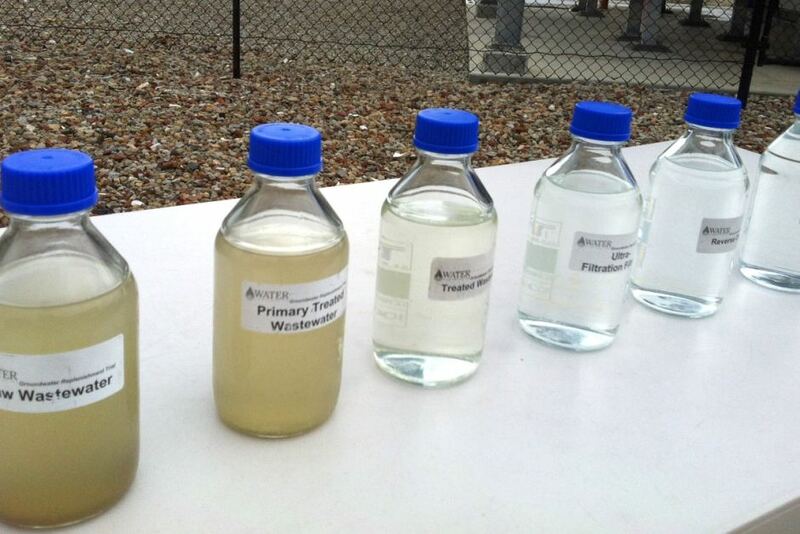 A selection of treated water from the government's groundwater replenishment pilot scheme. Credit: Stephanie Dalzell, ABC. Written for Foreground, thanks to Andrew Uro.